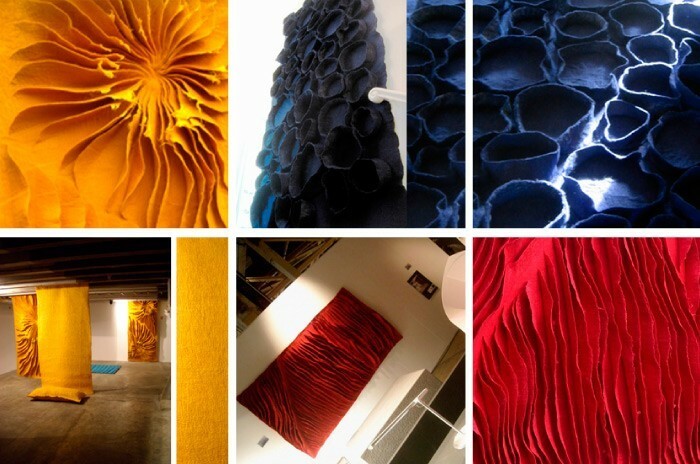 Using the soft and rich natural properties of felt, Felt for Architecture is a collection of handmade three-dimensional carpets and wall hangings and is created in collaboration with architect Claudio Varone and felt artist Anneke Copier Wool being naturally fire resistant allows it to be used in commercial and residential applications. And thanks to its three-dimensional character, it also has great sound absorbing properties. The material can be manufactured in the form of panels, tapestry and upholstery, allowing for a wide variety of applications including walls, flooring, and furniture.